They have everything ready to go for mass production with manufacturing and shipping partners. Once the campaign closes, manufacturer goes out of business taking lots of the money with them. They can not find new manufacturing partner because product really can not be made and shipped at the promised price point. Backers get back pennies on the dollar. Real product and they know they can make 20 in the basement in a couple of weeks, but end up with 1,000 orders and no experience on how to ramp up. In the post campaign euphoria, they quickly waste most of the money frantically and inefficiently ordering materials and equipment. Years later the orders are still being filled slowly and sporadically. Had built prototypes and all the remaining issues seem trivial. They aren’t. In the weeks following the campaign, they start trying to put together a final shippable product and find blocking problems at every turn. There is a reason no one ever made this product before – and it is not because no one ever had the idea. They end up shipping basically a box of parts that can not be realistically made into the promised product. Someone else thought of it first. As soon as campaign closes, they get served with a patent cease and desist. The money is spent on lawyers. There is no real product – just a few paragraphs of text that sound superficially like a great idea. They take the money and run. The root cause of all these failures is misplaced incentives. Founders get all the money up front, and so have absolutely no incentives to plan correctly, execute quickly or efficiently, or satisfy backers1. These could all be mitigated or prevented by proper project management. I’d call it something like “KickStarter On Track” and it would be an opt-in feature. Every KickStarter On Track project would additionally have a list of specific milestones, each with a date and a disbursement amount and recipient. The very last milestone would always be “Backers agree that project is complete”, and the disbursement would be any remaining balance to the project creators. founders do not see any money until backers are satisfied. You can still have project failures, but now the incentives are in the right places. But I think the real benefit of the system is that is requires people to actually think concretely about these steps rather than just imagining their end goals. This can make all the difference. When are you going to make your first payment? Where will you get the money for that payment? Do you have customers for these products? How long will it take you to print these products once you get the press? Do you know how to operate the press? Where will you get money to buy the ink? Where will you get money to fix the printer when it breaks? They don’t know anything about the printing press business, but often just asking the questions will completely change the outcome of the loan. By nailing people down to common sense specifics (“If it will take you 1 month to complete your first order, you can’t make your 1st payment in 2 weeks”), they end up making much more realistic loans and have fantastic repayment rates. Why would KickStarter do this? Eventually people like me are going to get tiered of funding failed projects.When that happens, the party is over. This could also help KickStarter differentiate themselves from other crowd funding sites and offer a high value, low risk experience to backers. Finally, they could charge an overhead management fee that would be an additional revenue stream. Why would a founder do this? The obvious reason is that it will make the campaign more attractive to backers. Less obvious is that (I think) most founders are well intentioned and they want their projects to come to a happy completion. Hopefully they will welcome any help they can get. Who would decide a Milestone has been reached? The crowd-ish way would be to to have backers vote on it. Want the backers to approve your “completed molds” step? Invite them to a meeting where you let them touch them. When 30 backers tweet and Instigram about how awesome the molds came out, the rest will happily agree. This crowd auditing system is very hard to cheat and leverages the best of crowd wisdom. You’d want to build a nice site to make all this interaction easy, but KickStarter needs this anyway. Any time a milestone date expires, the default action would be to refund the balance of funds to backers. Backers could also consent to extending deadlines if the founders could convince them to. Couldn’t you do do this as an external site not affiliated with KickStarter? Sure! You would need to get people to trusty you – which you could maybe do if you are already an established project management entity. KickEnder.com would be a great domain- alias, it is taken. Let me know when you get it up and running! 1 Ok, they may have some non-financial incentives like being good people, and having good intentions, and wanting to reserve their reputation so they can successfully fund future campaigns. In practice, these non-financial incentives do not seem help much once the campaign is over and the money is gone. PayTrustExport still works after all these years – and how to put the post office out of bussiness! I just got my 2013 archive CD from PayTrust, and the PayTrustExport tool still works! If you use PayTrust, you should use this tool to make an unencrypted backup copy of your data. While I am glad the tool still works, I am very sad that they have not done any meaningful work on this system since Intuit bought it back in 2005. With a tiny bit of effort, they could save us users thousands of hours of work and frustration. Considering that the US Post Office is going out of business, I think there could be huge value in services that divert traffic away from the mail system. PayTrust is well positioned for this play. In case you don’t know, PayTrust is a system that lets you receive your paper bills online. They give you a special postal address somewhere in South Dakota and you set up all your bills to go there. Every time a bill arrives at PayTrust, they open the envelope and scan the bill and then email you. You never have to touch the paper (or possibly loose) the paper. If I owned PayTrust, I would make some very easy improvements to make the system better, and then immediately make it free. Even in its current dilapidated state, it still saves me significant time every month and if it were actually good and free, I think huge numbers of people would start using it. With a large number of users receiving their paper bills though the system, I’d be in a unique position to start diverting paper mail. Fist step would be to run a report of the top billers sending paper into the PayTrust scanning center. Then I’d start making very easy phone calls…. See what happened there? 100,000 pieces of mail completely diverted from the USPS’s trucks and trains and planes. Millions of sheets of paper saved. Everyone is better off – Amex saves money and is able to focus on what they really do rather than printing and mailing, the customer gets the bill sooner and with higher reliability, and PayTrust saves having to scan and store all those paper bills. The only apparent looser is the USPS, but considering how unprofitable they are maybe having less mail will help them to lose less money. Repeat the above steps for everyone who is sending bills into PayTrust and soon you will reduce the flow of paper bills to a trickle. Yeay. There are some other interesting angles, too. PayTrust could also get into the paper bill mailing business. I know this sounds backwards, but bare with me. This requires buying, building, or renting a huge bulk mailing operation – basically a bunch of very fast printers scattered around the country near the postal distribution hubs. Enter your email address here to receive an early copy of this bill via email 3 days before it comes via postal mail. With no downside (they still get the paper bill same as always, just now also get email a few days sooner), many people who are otherwise reluctant to switch to ebills will sign up. Once that is done, the cover letter on their future paper bills will say something like..
You should have already gotten the email copy of this bill a few days ago. Are you tiered of opening envelopes and sorting papers? You can now choose to all your PayTrust paper bills mailed to you in a single envelope once every week, month, or year. You will continue to get your early email copies like you do now, and will also get the periodic backup paper copies to keep – already sorted and ready for you to file away. Again, no downside and lots of value for the customer, so many people will opt for this. While I am still printing and sending paper, I am paying a lot less in postage because I can now put many bills into a single envelope, aggregating both multiple bills from the same sender and multiple bills from multiple senders into a single periodic envelope. It is much cheaper to mail 1 envelope with 20 pages in it than 10 envelopes with 2 pages in each. In the case of a person who ops to get all the backup copies mailed to them annually, I can send a single Priority Mail parcel with 500 pages of bills for about 1/10th the cost of sending sending 100 bills of 5 pages each via First Class. Again, if I do it well (always printing sending out backup copies the same day people request them and even offering to print them instantly at a local FedEx if needed), then I will end up almost never actually having to print bills. The end game, then, is moving a huge amount of mail into electronic form and, at each step of the way there, both sender and receiver were better off and did not have to give up anything that they wanted. Compare this to the current path from paper bill to ebill, which requires work to log into the website of each biller and figure out if they even do ebills, then find the way to opt in, which almost certainly will immediately terminate your paper bills forever. If anyone at PayTrust is listening, please call me and let’s get this done. Come on PayTrust, let’s save some trees (and trucks)! As of 5/16/2016, this has come true! Well, sort of. Points rather than money and generally much less than what I think is justified- but it is a start! There is nothing worse than arriving at your destination only to find the station full. 48 docks… and no where to park. You are stuck with the bike and you can’t do anything else until you find a free dock. The free dock hunt is frustrating and sometimes kills any time saved by taking the bike in the first place. 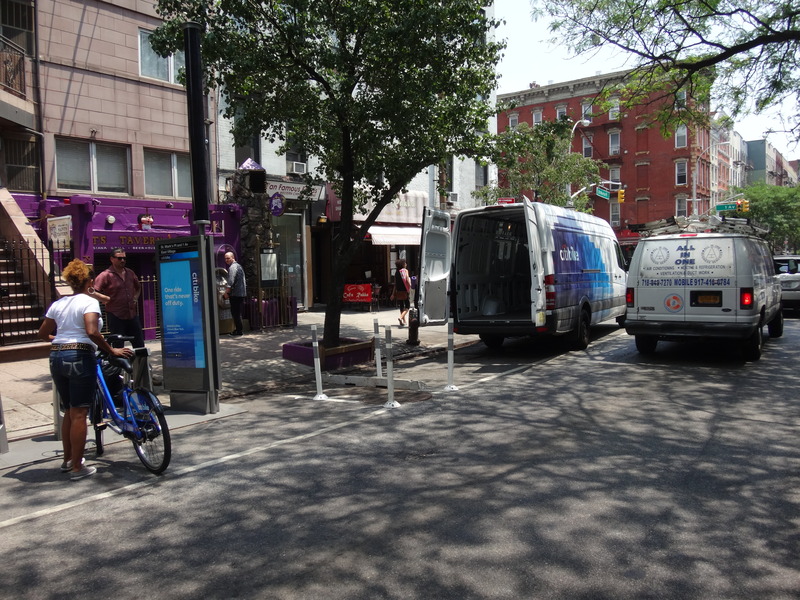 They do send around fancy CitiBike vans to move bikes around, but the effort is futile. 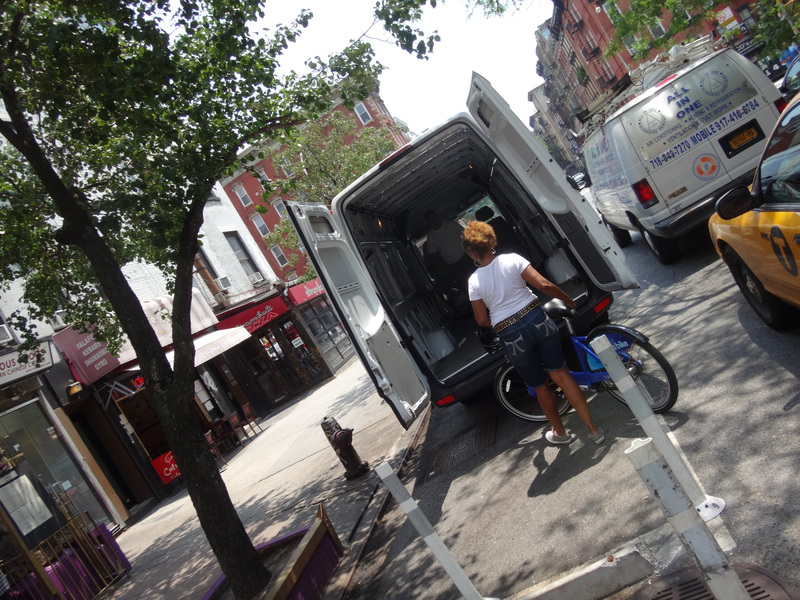 Having people driving vans full of bikes around NYC is wrong in so many ways. I’m guessing that keeping one of those vans on the road costs $100k-$200k per year (think about the salaries, gas, insurance, and depreciation to start). I’d also guess that each van can only move 10-100 bikes per hour. There must be a better way. Simple. 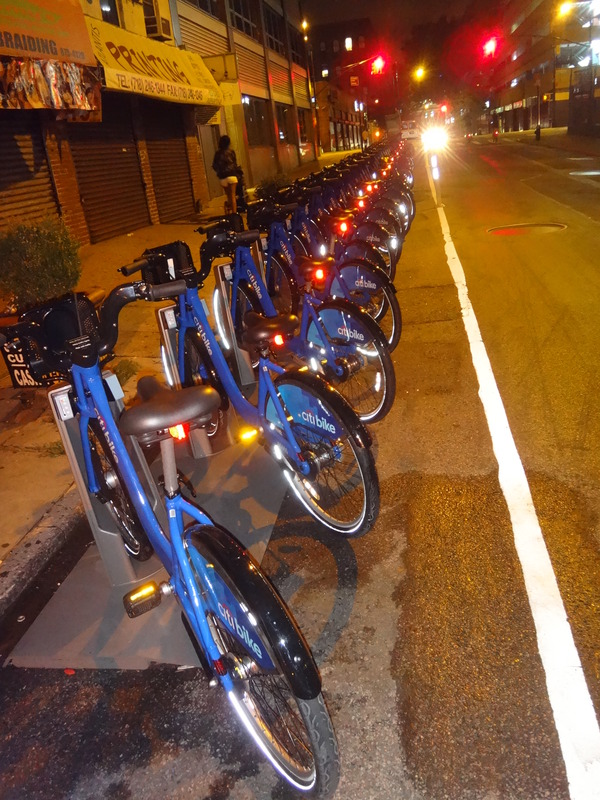 The $5 bounty would automatically get applied to your CitiBike account. Do it one every couple of weeks and your annual membership is free. Do it more, and you have a new (fun!) job. If you don’t have an account, then the trip would just be free. Same checkout procedure as a normal day trip, but when you return the bike to a non-full station you just don’t get charged the normal fee. First step is a simple software change in the billing system. Quick and straightforward to implement. It could even be done as an offline system that searches for qualifying trips after the fact and then applies a credit to the account. You could start the new policy immediately and bring up the software later, applying the credits and refunds retroactively when the software is ready. Immediately the number of frustrated people not able to return a bike drops. Huge win for almost no work. … feature to the CitiBike app, just to make it even easier for interested people to collect. In the meantime, if CitiBikeNYC says it is ok to use their data, I’ll happily write a Show Me The (Bike) Money app for people to use until the new CitiBike app is ready. Next step is to add a bounty for returning bikes to empty stations. This is not as important as the full station bounty (real and mandatory costs of not being able to return a bike are worse than the opportunity costs of not being able to borrow one in the first place), but could still be very effective in keeping bikes well distributed throughout the system. Start using demand prediction to get ahead of the curve and move bikes before stations are empty/full. A predictive/reactive self-balancing system without heavy fixed costs like vans and bike wranglers, and a new class of professional bike riders. Please?